Ukraine’s parliament adopted a law granting special status to the Donetsk and Lugansk regions. 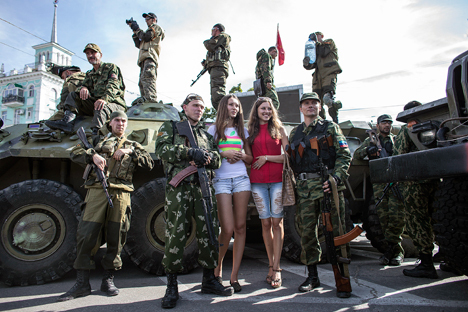 Russian political scientists have, however, remain sceptical about peace prospects in southeastern Ukraine. “The Ukrainian authorities set about outright blackmailing the Donetsk and Lugansk regions after the ceasefire was reached. Kiev’s statements about building a wall [Ukraine has announced plans to fortify its border with Russia – RIR] and creating certain reservations on the Russian border confirm this. The actions of the authorities in Kiev are cynical. They present the negotiations between Poroshenko and Putin as evidence that Russia is a party to the conflict,” said Bordachev. “Putin and Poroshenko are the main participants and actors in the negotiating process. What is the current ceasefire plan called? Putin’s plan. What is the name of the peaceful resolution put forth in June? Poroshenko’s plan. That says it all. It wasn’t Leonid Kuchma and the representatives of the breakaway Donetsk and Lugansk People’s Republics – Igor Plotnitsky and Alexander Zakharchenko – who determined the outcome of the negotiations in Minsk. The truce will last as long as it is beneficial to the leaders of both countries,” Karasev told RIR. In the opinion of Andrei Sushentsov, a political scientist and managing partner at the Foreign Policy agency attached to the Moscow State Institute of International Relations, the issue of determining the political status of the Donetsk and Lugansk regions will be dragged out.